Elf on the Science Shelf – Magic Star and Dancing Tinsel – Science is Fun! This is the second in a series of posts featuring science activities for your Elf on the Shelf. You can see the whole series here. 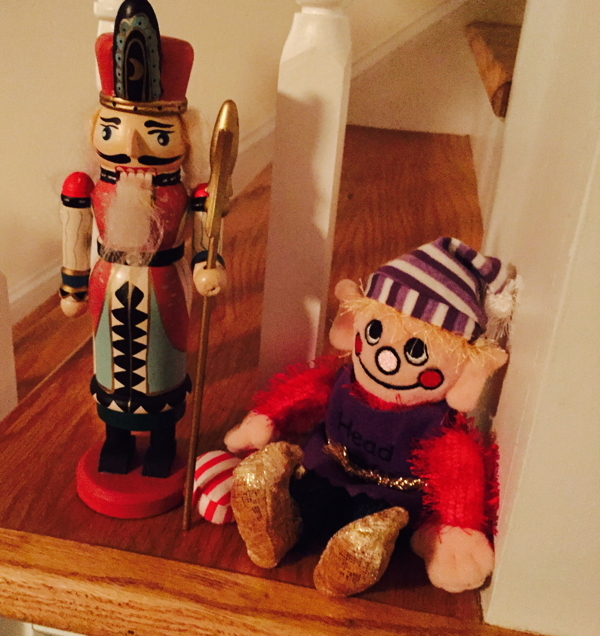 It is only the beginning of the season and I’m already forgetting to move our elf, Elrond. He’s chilling with the nutcrackers this morning. I save his more interesting antics for the weekend when the kids have more time to appreciate my his effort. The Magic Star trick is an easy one. If you are more ambitions (and dare to put tinsel on your tree) try Dancing Tinsel. Not much science in this one but it’s still fun. The water softens the wood in the toothpicks so that they straighten back out again to make a star shape. Break the 5 toothpicks so they are bent in the middle but not separated. Arrange them on the plate as shown. Include the following note next to your elf. Pour a little water in the center of the toothpicks to reveal a shining star! Have the kids slowly pour the water onto the plate right in the middle of the toothpicks. In a few seconds you will see the star! Let the kids see what other shapes they can make this way too. You can see a more detailed version in this post (including troubleshooting and ideas for more exploration). I tried to keep it simple for the elf. Gather six 6-inch long pieces of tinsel. Carefully use another piece of tinsel to tie the bunch all together on one end and then again at the other end. Set out the tinsel and blown up balloon or PVC pipe with the following note next to your elf. You can make this tinsel dance with a little static electricity. Just rub the balloon on your hair, sweater or furry pet to charge it up. Hold the tinsel above the balloon and drop it so it lands on the balloon. The tinsel will take the same charge as the balloon and since like repel it will float up above the charged balloon. Can you make it dance around?